The Balboa Cafe's site promised the following: "...The elegant bar and interior decor remain relatively untouched, retaining the magic of times gone by, while the menu offers both treasured favorites and savory new dishes. On any given day -- for lunch, brunch, cocktails, or dinner couples, singles, old-timers and newcomers can be found reveling in the joyful din of this San Francisco icon." Blah, blah, blah---it was a toilet; it reeked of stale booze; it had a movie theater floor stickiness to it. This did not deter the intrepid Tess of the B'Urgervilles or myself from soldiering on to sample the well-reviewed cheeseburger at Balboa Cafe. 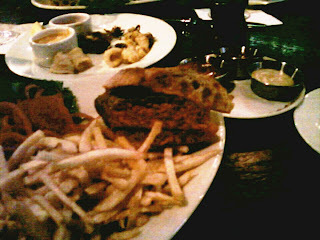 They had a burger, and Gayot.com proclaimed it to be the best thing in that city of vegan self-righteousness. 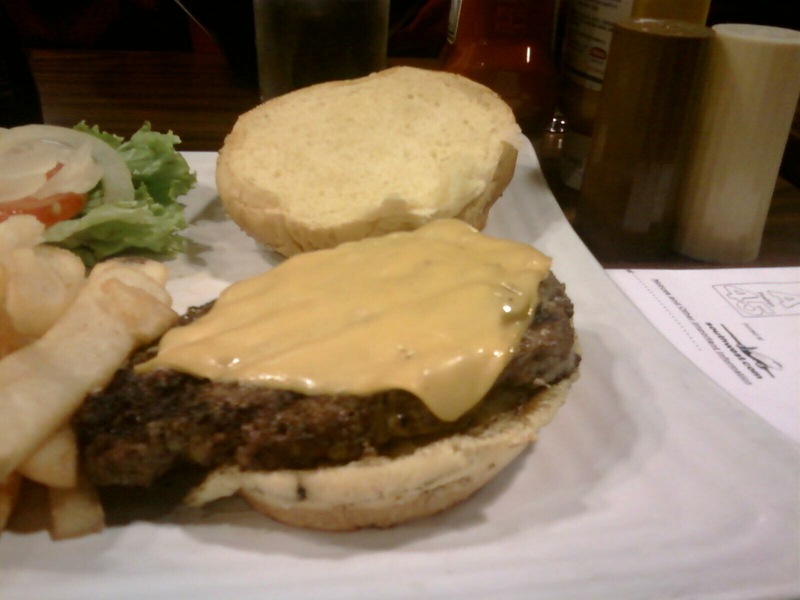 Sorry, for the grainy pic--the place was very dimly lit (below, there is a great shot of a really awful burger at SFO.). The burger came out a perfect Med-Rare, and the blood was already soaking into the crusty baguette upon which it was served. The baguette really worked, because of the texture that it brought to the party. On top of that, the crunch of the crust gave way to something much more yielding as the blood, fats, and other cow juices soaked into it. The sear was just right on the oval burger--all you Father's Office fans, do not get excited--this burger was NOT an absolute pile of crap--it tasted good. They hit it with salt and pepper. The beef was well-aged, if not a little (lot) on the oily side. The burger was, in fact, greasier than the cast of the Jersey Shore, but the unlike that crew, the burger had substance and was enjoyable. Burger Review : Good enough.